This episode, this episode. It was interesting. I wonder if we will learn Sawaki’s real name before the last episode of this series or not? I did like how after episode one and doing things with Toru’s Next Innovation, Sawaki has regained some of her initial vigor that died after nearly a year of failed job attempts. And by the end of this episode, she is completely bright and cheerful and out of her drab job hunting clothes. I also like how much of a kid Toru is when it comes to expressing himself. It’s hard for him to apologize and hard for him to encourage, so he just ends up insulting people or just being really rude and abrupt. It’s fun. Now, I thought this episode really showcased how loyal Asahina is to Toru, but then with the previews for the next episode…you start to doubt just how loyal he might be. While one secret is discovered in this episode, more secrets still exist and we’ll just have to wait to see just what is going on. We open with Toru sleeping on his couch awakened by his robot vacuum cleaner. He gets up chooses very casual and comfortable clothes and heads out to his garage which has several cards and motorcycles. He sees Sawaki’s shoes and recalls the previous day. He takes them and throws them out since she doesn’t need them anymore. Meanwhile Sawaki is back in her job hunting clothes and looking for her new shoes. Drat, she left them in the car. She has no choice but to wear the worn out shoes. Her friend Ono calls and asks about how it went with Next Innovation. Sawaki, recalling Toru’s anger, says that things did not go well at all and she even got into a mess. We then cut to see Asahina confronting her about lying about her name. She seems to be an ordinary student, so why the big lie (which is illegal and considered fraud by the way)? Sawaki replies that she did not intentionally lie. She was so worked up and the name just slipped out. She is relieved that she is caught as she hates pretending to be someone she isn’t. Unlike the Sawaki from the last episode, she is more positive and has become more energetic in her job hunting. At Next Innovation, Yoko is getting a delivery for her restaurant opening and is upset that it is not what she ordered. A male employee comes out and says that he changed the order to ensure that there was enough. He then tells Yoko to focus on her innovative cooking while he takes care of the rest and walks away. Yoko mutters about how obvious and annoying male jealousy is when Toru arrives and Yoko says she will get the truck moved out of the way so he can get through. When she notices it is him she goes to talk to him, but he obviously has no idea who she is. Asahina explains later that was his little sister Yoko whom Toru had just met the night before. Whoops. And he said he’d remember. Asahina says that Fujikawa called and asked for Sawaki. What should they do? Should they call Sawaki to come in and help? Toru leaves that decision up to Asahina who wonders just why Toru chose Sawaki for this job. Toru says its because she is so similar to Fujikawa so she was the best choice. Asahina goes over with his cell and says he will call her then. Toru asks all nonchalant and says he doesn’t care. Once he gets out of the elevator, he is immediately scolded by Yamagami for his casual wear on a day when the stockholders are coming for a meeting. Yasuoka sits down next to him and Toru asks when the meeting is. Yasuoka gives him the time and Toru looks over at him and asks who he is. Yasuoka replies that is the 17th time and then holds up his badge and reintroduces himself. Meanwhile, the worried Sawaki arrives at Next Innovation apprehensive about just what will happen to her. She gathers her courage and says that they can’t bully her anymore and goes to head in when some plants fall over onto her. Yoko rushes in and the man in charge of the plants apologizes. Yoko asks if she is okay and then says there is a four leaf clover in her hair. Really? “Well not really, but faith makes you stronger.” This really helps give a bolster to Sawaki and you know that she is thinking how cool Yoko is. Yoko then invites her to the restaurant opening before walking away. 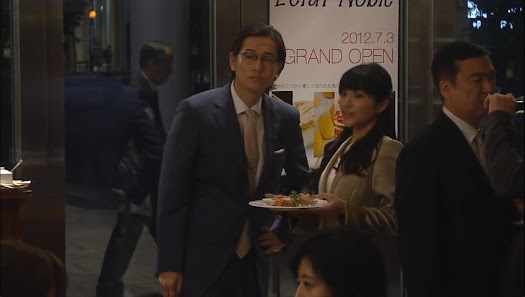 Poor Sawaki is then trapped in an elevator with the shareholders who eagerly await the greeting by the pretty female employee. They rush out pushing her forward. The employee greets her with a smile and comments on her drab clothing. Yasuoka then rushes forward to greet her and thank her for the work yesterday. 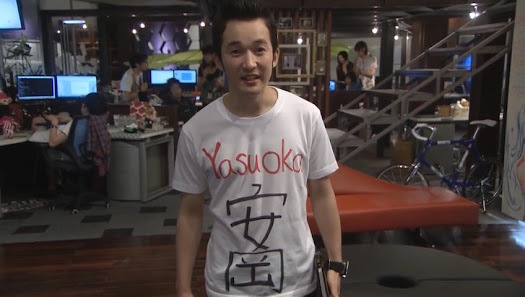 Sawaki notices he is wearing a T-shirt with his name written in Kanji and Romaji on the front and back. He explains it’s the 17th time today Toru forgot who he was, so he’s doing this to make things easier. LOL. Then in comes Toru. He has changed from his casual clothes into a suit. Yamagami is happy to see this change and when Toru complains about Yamagami’s clothing and threatens to go in naked, Yamagami quickly rushes off to change. Toru then sees Sawaki and uses her as an excuse to ditch the shareholders meeting. He introduces her to the team on the personal file project and singles her out as the epitome of an idiot. He also swears the team to secrecy on her real identity. Poor Sawaki. She even gets called out for her drab attire in hot summer weather. Later Sawaki tells Asahina that she was frightened he was going to sue her when she got the call. Asahina asks if he head, would she have dropped the pretense right away? Asahina then wonders just what importance the name Sawaki Chihiro has to Toru. It definitely caught his attention and kept him interested in Sawaki. He then wonders if she will be okay as she said earlier she couldn’t keep up with pretending to be someone she isn’t. Although it’s difficult, she will keep on as Sawaki for now as she wishes to prove she is not an incompetent idiot. Asahina then encourages her as he wishes someone would rid Toru of his prejudice AGAINST higher education. He claps her on the shoulder and says that he is a University of Tokyo graduate. Yasuoka shows her to his desk until they prepare one for her and out come the angered stock holders. Yamagami does his best to soothe their ruffled feathers (since Toru skipped out on the scheduled meeting) and Toru just ruffles them more so Yamagami shuts him out where he can’t be heard. Sawaki looks over and has to laugh as she sees Toru’s face against the glass, cheeks puffed out. The female employee from earlier then comes with new clothes for her. Sawaki changes and meets with Toru who is basically hiring her for two months to do nothing but smile and nod at meetings. Wow. She will get paid quite generously for this. Sawaki requests that all the employees be made aware of her true identity as they are treating as some cloud genius. Toru laughs (and thus Sawaki, too) at this and Toru says that is obviously a no-no. They must do their utter best to keep her real identity a secret so it does not end up leaked out to Fujigawa and co. Sawaki then says she can’t get paid for doing nothing and requests something to do. Toru says if she can find anything, then fine, but what exactly is she good at? The two set off together and in the car he gives her another huge binder to memorize. Sawaki points out she has classes and interviews. Toru says that is more reason to do this well if she doesn’t want to end up unemployed, although what she will make in these two months should cover her living expenses for a year. Toru then has the car stop and tells Sawaki to get out as he has somewhere he needs to go. As she gets out, she asks after her shoes. Toru tells her to forget them as he has trashed them. He then hands over some money and tells her to buy a newer, more expensive pair. Sawaki recalls the phone conversation with her brother and the money from her mother and cries. Not that Toru would understand, but those shoes had sentimental value. He can keep his money. This outburst shocks Toru. At a bar, Yamagami gets drunk and says that it should be Asahina running the company instead of Toru. Yamagami even promises to talk to the stockholders and do his best to ensure that Asahina becomes the new president. Asahina quickly tries to talk some sense into Yamagami. Toru is really the engine of the company. Yamagami is amazed at just how far Asahina’s loyalty for Toru goes. Enter in Yoko who is disappointed that Toru isn’t there. She was hoping to find him as she was trying to figure out what foods she should serve as she knows he’s a picky eater. Asahina whines that all women fall for Toru. Why is that? LOL. I can ALMOST envision a love triangle between him, Toru, and Sawaki. Almost. I don’t think that’s going to happen, though. Toru has headed to his favorite temple. He tells Fueki that he feels the most at home and at peace at that temple than any where else. He confides that he has met a woman who bears the same name as his mother. He can’t seem to part with her and always keeps her around him, but when she’s near him, he gets agitated and restless. Fueki thinks for a bit and wonders if there might not be some what that this Sawaki resembles Toru’s mother. Toru laughs at this and says that his mother was also a heavy and troublesome person. This gets Fueki chuckling, too. At school, Sawaki complains to Ono and Kuga about just how horrible Toru is. She does this while going through that huge binder he gave her as homework. It just so happens that Fujikawa is at the college to give a lecture and spots Sawaki. Uh oh. Cat’s out of the bag now. Sawaki then goes on an interview and she is a lot more upbeat and positive. She confesses that she has been on a number of interviews and was getting disheartened by constantly failing. The interviewer loves her honesty and also comments that her current situation where she was working with this person she doesn’t like, seemed to give her a new outlook. He then says that he will consider her for the open position. Score! This makes Sawaki so happy that her job drought might be coming to an end at long last. 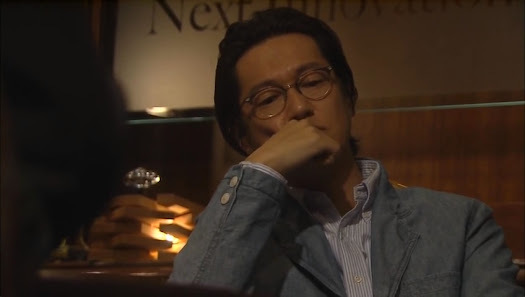 She does her best for Toru at a committee meeting (in which Fujigawa scrutinizes her closely) and finds herself recalling the interviewer’s comments and she smiles at Toru who catches this and wonders what’s going on. Opening night comes for Yoko’s restaurant and she is quite busy. However, she always scans the room for Toru. Asahina comes up to Sawaki and points out that Yoko is his little sister. This impresses Sawaki even more. Nogi comes out and starts picking at Yoko once more. Just when she is about to light into him, she spots Toru and rushes off. LOL. 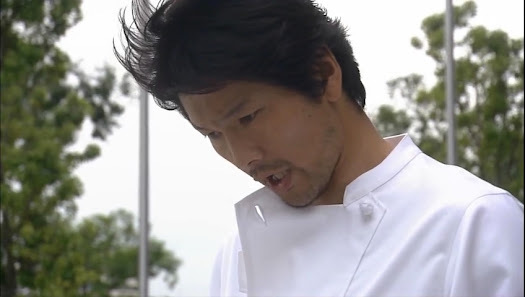 In the kitchen, Nogi and the other chefs complain about how Yoko was brought over from the states. 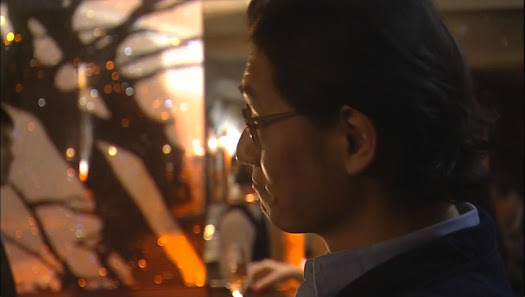 They believed that the restaurant should have been put in Nogi’s care and not Yokos. Ah, the sour grapes of unpromoted men. Yoko then goes and tells Toru that they met 9 years ago (that was before even Asahina had met him). Of course, Toru doesn’t remember this. Yoko says she understands that he can’t remember names or faces, but how about conversations? They talked for over two hours. That’s how she knew he was a picky eater. 9 years ago she asked him what his favorite food was so she could make it for him. Hence why omurice is on of the main dishes of the night. This all surprises Toru and Asahina. As Yoko gets up to leave, Toru tells her that this dish he could eat all the time is delicious. This makes Yoko very happy, however, she is still angry that Toru can’t remember her. Later that night the whole office is sleeping. Why aren’t they home in their own beds? Sawaki nearly falls asleep as well, but shakes herself awake. This is no good, she can’t stay sitting. She notices Toru upstairs hard at work in his office. She then brings him a cup of coffee. Toru barely acknowledges her and she quickly leaves. He looks over at the coffee and cautiously picks it to drink. It’s hot (while its coffee, duh! ), but I think that small gesture pleased him. Sawaki goes home early the next morning and lifelessly checks her mailbox. She quickly perks up when she sees a letter inside. When she opens it, it is a final interview request. This basically means she has the job in the bag! She happily tells Asahina this. If she gets the job, she will be too busy to continue working at Next Innovation. So she will quit? Yes, as she feels she isn’t the right fit for Toru’s company. Asahina asks if she will tell Toru herself. Sawaki laughs and says she doesn’t know how to handle him. Asahina chuckles at this as well. He then says that mystery of Sawaki Chihiro will never be pierced. Looks like he was really hoping to learn the truth behind the name. Sawaki is dressed in her usual suit and setting out to attend her final interview when she gets a call from Asahina wondering if it was all possible for her to come as Fujikawa has requested a meeting. Sawaki apologizes as there is no way she can go and still make her interview. Asahina understands this and wonders what they shall do while Sawaki looks at her watch and tries to figure out just what to do. Fujikawa reveals that she knows Sawaki is a student was used as bait to lure her into Toru’s proposal. Uh oh. At this time Sawaki rushes in apologizing for being late. Fujikawa is ashamed that she allowed herself to be tricked. She and the committee had discussed things and have decided to put a ban on Next Innovation ever being able to get a government contract. Yikes! I loved how in this scene Asahina did his best to diffuse the situation and protect Sawaki from harm and Toru called a spade a spade and wanted to go on with negotiations without the girl bonding. Asahina wonders what they shall do. How can they go ahead without the government contract? Toru is not discouraged as there are other means. What are those means? Asahina also reveals that Sawaki skipped out on her important interview to come and help them. Toru says its an invaluable lesson for Sawaki then and this annoys Asahina. Can’t he see Sawaki’s pure heart? Meanwhile, Sawaki waits and waits for Fujigawa so she can talk to her. Fujigawa ignores her day after day until Sawaki trips and Fujigawa helps her up. Sawaki says that she really does like and admire Fujigawa and she hopes she can be liker her. She also says that Toru honestly wants to help people, so can’t they consider lifting the ban? Fujigawa says that is why she is really unhappy. She wants to help people and she knows that Toru does, too, but unfortunately, the people he work with aren’t that earnest. Just who is she referring to? Asahina, who was probably in the area to visit Fujigawa, witnesses all of this in surprise. Asahina reports Sawaki’s visits to Toru who asks why she would be going there. Asahina says that she is trying to negotiate a second chance with Fujigawa for Next Innovation. This makes Toru laugh. How typical. The girl thinks guts and persistence will overcome any obstacle. Asahina gives him a sad smile and tells him that’s all people with guts and effort can do as they have no other option. Asahina gets out and Toru’s face changes. Is he feeling guilty? Or is it something else? At the college, an uproar is caused when Hyuga Toru comes to campus. Sawaki seems him and is immediately scared by the look on his face. As he stalks towards her, she immediately does a deep bow (I think she goes further than 90 degrees) and apologizes for not calling him sooner. The first words out of Toru’s mouth is calling her an idiot. Between helping his company and helping herself, she should have gone to the interview. How stupid can she get? Sawaki apologizes and says that she only wanted to help him. Toru explains that she is only a pawn on his chessboard, so how can she think she has any responsibility? So, this means he’s made that she visited Fujigawa? 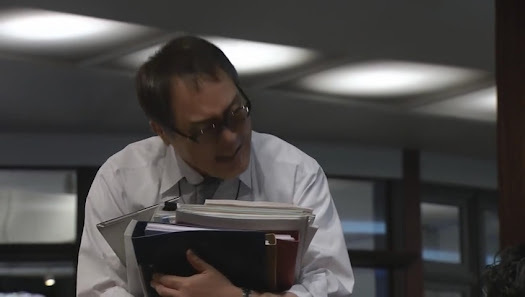 Toru yells out does he look angry and Sawaki immediately answers that he does. LOL. Cute. Toru says he’s the one responsible for her lie, so he’d feel horrible if he ruined her precious interview. So…he came to apologize? Toru thinks on this and throws all the fault back on her and goes to leave. Ah, typical Toru, such a kid who can’t say how he honestly feels. Toru goes to leave and Sawaki shouts after him if that was really all he came to say. Toru turns around and rushes back and hands her a bag. She says that she doesn’t think she forgot anything and he tells her to just open it. Sawaki hurriedly obeys (he’s right, she’s like a very obedient dog) and is surprised to find her shoes. She thought that Toru had thrown them out. Toru then scolds her for being persistent with Fujigawa, but now with those shoes that she valued. Sawaki says that he had said he threw them out, that’s why. Toru then says that Sawaki’s attitude and persistence actually did touch Fujigawa. Toru says that she’s almost good, if only she thought a little more carefully. She then thanks him for packaging them so well. He says it’s because he hates smells and rushes off. She thanks him and says she will do her best job hunting. Toru stops and wishes her luck. He also tells her that Next Innovation is seriously considering her application. When meetings resume with the ministry she will be expected to help out and attend meetings again as Fujigawa insisted they keep her as an intern. Toru yells that their bonding is disgusting and tells her to report to work the next day and tosses her the badge. Sawaki goes to Fujigawa and thanks her. Fujigawa tells her that she did what she could as Sawaki really impressed her. Fujigawa also said that she owed Toru. How so? She gave him virtual data on a number of citizens, roughly for a city the size of Tokyo. Toru impressed her by getting all the data catalogued and recorded in only an hour and not days or weeks or months. Toru explained that the government companies move slowly and take forever while offshoots like Next Innovation are steps ahead and can get it done much faster. Fujigawa was very impressed, although the ban will not be lifted. Hyuga Toru is a gifted and amazing man. Sawaki wholeheartedly agrees. The next day she heads to work with her hair down in a very nice summery outfit. She has finally shed her job hunting standard black suit. She sees Toru pull up in front of Yoko. He smiles and greets her by name! This surprises Yoko, but she is happy even though it isn’t a big deal to be that excited over. Her brother is in his office requesting further investigation into Sawaki Chihiro (I think he means the fake one and not the real one since it’s the fake Sawaki’s pictures all over his desk). If anything incriminating pops up, they’ll hold onto that for use in the future. Hmm, looks like Asahina’s a lot more dark than I thought he was. He was also looking into some connection to Fujigawa earlier, too. I just never know what to make of him at times. Toru meets Sawaki in the elevator. She’s there? She’s there because she was called. He says that she seems to have found her skin sensation (he complained about her unsummery clothes earlier in the episode). Sawaki smiles and says “because it’s summer.” This makes Toru smile in return. He tells her that he likes her better that way. Sawaki smiles even brighter. The elevator opens and the two get out together and walk side by side. Toru glances at her out of the corner or his eye before smiling again and that’s where this episode ends. It looks like Sawaki and Toru just might have a past connection (whether either of them are aware of this or not). Toru gets closer to both Yoko and Sawaki and it looks like there’s some tension with Asahina. I can’t wait til next week! Thank you for Recaps. I love Oguri Shun so when I saw this drama featured in Dramacrazy, I had to watch it, eventhough I had to steal time from my office hours! Now I am in Agonyland, cos I have to wait each week for a new episode! I just finished watching live streaming Ep 3, and I can only understand a handful of Japanese words! That’s why I’m so thankful for your Recap! Thank you, from the bottom of my heart. Now waiting patiently for English subs. I think that Toru is fascinated with Sawaki, and they have a past? Not too sure, cos my streaming was really bad, but I stuck through the end. Now I can’t wait to understand what Toru said to Sawaki at the end? I will try to get the 3rd episode up tomorrow. 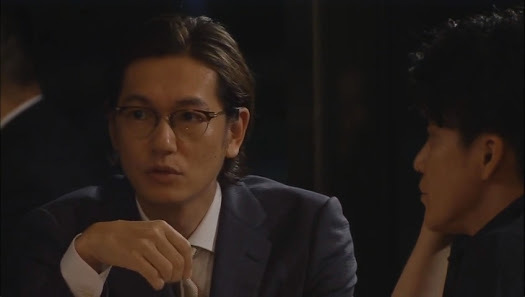 I am really enjoying this drama, and I think you’re right, Toru is fascinated by Sawaki. In certain ways she’s the epitome of everything he despises, but yet there’s just something about her that draws him in and I don’t think its just the name. Yay! Thank you for going to do fast recapping of Ep 3! I’m wondering if Toru had that forgetful illness from forever, or whether some crucial event happened to him in the past to make him forget things – like a coping mechanism. If it is, I wonder what was the event that triggered his illness? I do believe there are documented medical conditions where there is something wrong with the brain that it can’t recognize certain things, such as faces, etc. But you’re right, it could be a trauma that has caused this disease in Toru. I wonder if it happened after his mother left him when he was a little boy? 1. I don’t believe on Sawaki when she replied to Asahina that she did not intentionally lie or so worked up and the name just slipped out. I believe she knew something about that name. But she chose to lie about it. 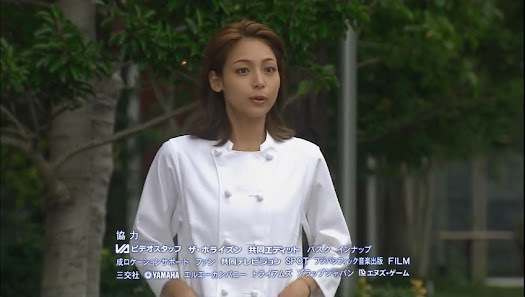 2. in episode 2 – my love rival has shifted between Sawaki and Yoko over Toru. Loved that final sceneof our main couple. Gimme that side stare, Toru…ahh! 3. i believe that Asahina is a darkforce over Toru;s downfall. That she will use Sawaki to ruin him? or i might be too rude in having that thought,huh! 4. indeed, Sawaki and Toru have interesting past that because of latter’s memory slip – he forgot. It might have happened during their youngster years. Well, Rich Man, Poor Woman…how come you have a vibe to that of Korean drama Queen Inhyun’s Man for me…i guess, on main couple’s chemistry perhaps equals ADDICTIVE ! Oh,boy…cant wait for ur recap of Episode 3. Thanks. I totally agree with 3 of your 4 points. As for Asahina, it’s kind of hard to tell just what will happen with him and Toru and if he will eventually turn on him. We can only wait and see. Glad you are enjoying the recaps! 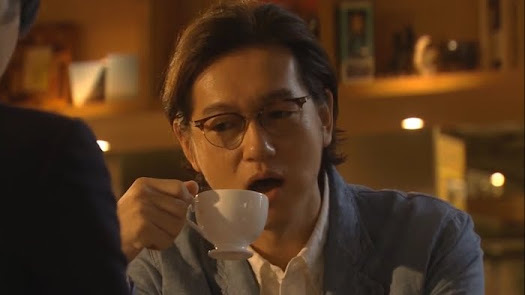 I recently started watching this drama but since i’m having a hard time viewing ep2 this recap was very helpful..ugh..on the other hand I totally don’t trust Aashina at all he gives me a bad vibe everytime i see him.. That dude is up to no good! Yicks! Gosh its already far ahead i need some sleepless nights to catch up.! Thanks again for the recap^_~. Glad I could help! Yeah, I never knew just what to think of Asahina. His character is a hard one to wrap your head around and when you see all the things he does, it’s hard to completely trust his friendship with Toru. thanx here as wel. This epi showed another side of Toru that he is nt just strict n heartles al the time bt he has a mischievous kid hidden somewhere in his heart and who njoys teasing people like sawaki who fascinated him. And by al his antics he wanted to confirm what are they and how they are the way they are. And that smile and stare frm the corner of the eye was killer. Yep. Toru’s got some great depth that you don’t see at first. I love his personality as he is really just a child at heart, but you can really see his more adultness in his regular business behavior. 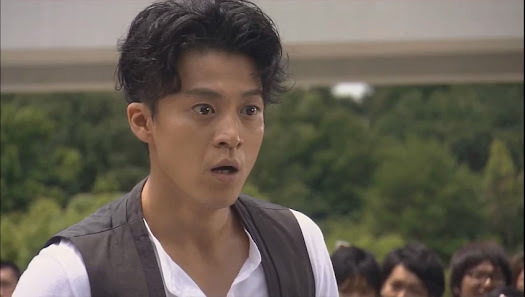 Oguri Shun did such a great job of acting this child-man role to a “T” – I just loved Toru throughout this series.